The Wilderness wear 160 Merino fusion top is made in Australia from 50% Pure Australian Merino and 50% Ultra-fine Schoeller Polypropylene 190gsm double jersey. It has a very soft hand feel and feels very lightweight for a long sleeve shirt but it still retains all of the benefits of merino wool. The problem I usually find with merino wool blends is that while they do dry quickly and wick moisture they often still end up needing to be washed after every wear. They don’t seem to retain the antimicrobial properties of pure merino wool. I didn’t have that problem with this shirt though. The ultra-fine schoeller polypropylene acts just like merino wool in wicking moisture. It also retains quick drying and antimicrobial properties. In terms of sizing when I first tried on the Medium size I felt it was a bit big for me. The size I’m wearing now is the Small and it feels a bit too small especially in the arms. So I’d suggest going with a size up from what you normally wear if buying this shirt to get a fit that covers your arms. However the small fits my perfectly everywhere else except arm length. 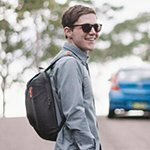 In terms of pricing, the merino fusion 160 shirt comes in at $99 AUD and unfortunately only 1 colour. Which seems very reasonable for what you get. This shirt does breath well in the summer and I don’t feel hot wearing it. It also feels very warm and comfortable in winter. So it acts just like a merino wool garment with a lot less weight. Overall while I’m not a fan of the contrast stitching and would have liked to see more plain solid colours, I do feel in terms of a baselayer it does an excellent job. A quick shout out and thank you to Jon at wilderness wear for sending out the shirt.